We thank you for your interest in trusting us with your work. Below are some important points to bear in mind while going through the editing process with the McGill Journal of Dispute Resolution. The MJDR publishes articles, essays, and book reviews. We look for well-researched and well-written work that advances or challenges the current state of alternative dispute resolution scholarship. There is no typical submission. We ultimately strive to innovate and facilitate discourse between academics, practitioners, and the public at large. We accept classical academic manuscripts under 30,000 words, case and practitioner comments between 3,000-10,000 words, as well as works of original character approved by the Editorial Board. Google Scholar, SSRN, HeinOnline, CanLii, and more. You can rest assured that your article will be placed where others look to get informed. As a contributor, please be advised that the MJDR holds the exclusive rights to your manuscript. We trust that you will not submit your article to other journals concurrently. In order to reduce the time between submission and publication, we accept and edit articles on a rolling basis. Your article will be published online upon having passed through the editing and peer review processes, and will later be combined with other published work to form an issue. We believe this process allows our readers quicker access to cutting edge ideas and advancements in alternative dispute resolution, while giving authors the opportunity to be published in issues side to side with other known scholars and practitioners in alternative dispute resolution. 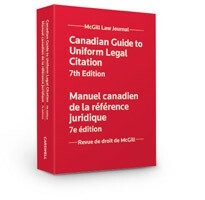 If you would like to publish with the MJDR, please follow the Canadian Guide to Uniform Legal Citation. This is used by all major Canadian legal journals, and is accessible online as well as in all Canadian law libraries. We also ask that our authors respect the requirements of the Chicago Style Manual. Should you have inquiries about the publishing process, please contact our Coordinating Editor : coordinatingeditor.mjdr@mcgill.ca or click here to find out more.